Following your gut or going by the books – it's an age-old question in business. And the former is one that doesn't gain much clout among professionals. For the most part, it's considered a step that should be avoided, and only used when there are stats and facts that back said decision. (Which, if we're being nit picky, isn't really following one's gut at all.) Yet there are still so many entrepreneurs who swear by these by-the-seat-of-their pants decisions. Who have made their own success by going willy nilly, even on the biggest of decisions. And it's worked. When done right, and when you have business knowledge on your side, gut-decisions actually aren't something that's taboo. Instead, it's a tool that can help you personalize a brand. A step that helps streamline decisions and gain growth through methods that others aren't able to make, or that they aren't willing to try. Just be sure you go about following your gut the right away. It ensures these seemingly rash decisions will work in your favor. Logic is your friend in business, and in life. If all the odds are against you, your idea might not be the best. Be sure to weigh out each step logically before you take steps toward or against a decision. Even with a quick gut-based decision, you can take a few minutes to weigh you the logic behind each potential outcome. 2. Are You Usually Right? Seriously. How often are you wrong vs. right? This isn't something you have to admit out loud (we won't hurt your pride). But take a minute to internalize the answer – if you are prone to a wrong gut instinct every now and then, you might not want to go gut-first. If you have a hard time being objective about your own abilities, ask a trusted friend or family member about your odds. It's important to ask someone who can answer honestly. The bigger the consequences of something going potentially wrong, the more time and effort you need to spend on your decision. For instance, in a situation where you might lose a few bucks if something goes awry, it's no big deal to decide quickly. But when the stakes are far higher, you should be less likely to jump into a scenario that could leave you high and dry or worse. 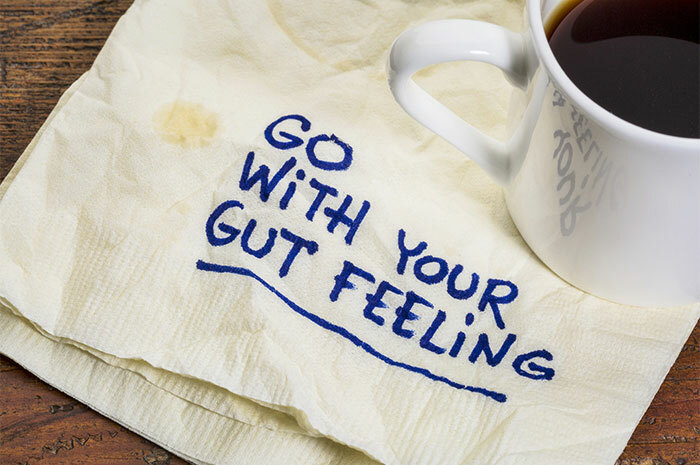 You certainly won't be the first business owner to follow their gut. Nor will you be the last. Take a few minutes to determine how others fared with their instincts, as well as what adjustments they made. Having this information down deep will make it easier in making swift choices. It will also add some confidence to even the rashest of business moves. Duh! The biggest rule in doing what feels right is actually listen to what feels right … then doing it. It's hard to vocalize exactly how it feels when you just "know" something is the right move. But you sense it down deep, and the only way to move forward is jumping all-in. One truth about making an unexpected business move is that folks will have a lot of questions. Likely ones that question your logic and/or sanity. Instead of entertaining those doubts (or risking sounding like you're on the defense), be prepared to tell folks why your plan is going to work. Then embody the very confidence your latest business move needs. Changing the way you do business is never an easy step, but it's one that's necessary to find growth. When these gut situations come along, count your ducks, cover your bases, and fall into the decision that you know is best.